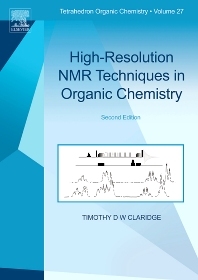 High-Resolution NMR Techniques in Organic Chemistry describes the most important high-resolution NMR techniques that find use in the structure elucidation of organic molecules and the investigation of their behavior in solution. Tim Claridge has over 25 years of practical experience in NMR Spectroscopy and is presently Professor of Magnetic Resonance and Director of NMR Spectroscopy for Organic Chemistry and Chemical Biology in the Department of Chemistry at the University of Oxford. His interest in NMR was ignited as an undergraduate student of Chemistry and Analytical Science whilst undertaking a year-long industrial placement in the spectroscopy laboratory of a leading pharmaceutical company. He subsequently completed a DPhil in protein NMR spectroscopy under the supervision of the late Andy Derome in the Dyson Perrins Laboratory at the University of Oxford. He then remained in Oxford and was appointed manager of the organic chemistry NMR facilities and in this capacity co-authored the undergraduate text "Introduction to Organic Spectroscopy (OUP)" with Prof Laurence Harwood and produced the first edition of "High-Resolution NMR Techniques in Organic Chemistry" (Pergamon Press). He became University Research Lecturer (Reader) in 2006, and was made a full Professor and a Fellow of the Royal Society of Chemistry (RSC) in 2014. He served for many years on the RSC NMR Discussion Group committee including as its Chairman for three years. He has co-authored over 170 research papers and his research interests focus broadly on the application of solution-state NMR methods for characterizing small molecules, and for studying their behavior and their interactions, especially as ligands for biological macromolecules.